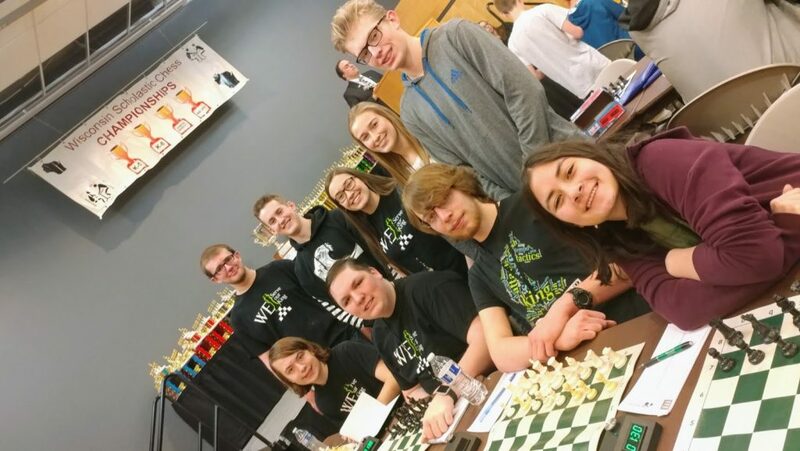 KML attended the Wisconsin Chess Championships on March 23-24, 2019. The Varsity chess team was seeded in Division 2 this year. Freshman Ryan Wirkkula earned the Board 1 spot, followed by senior Josh Weber on Board 2, senior Ben Polheber on Board 3, freshman Kimberly Schill on Board 4, and junior Max Banner on Board 5. The team won two of their five matches on the weekend, finishing in 8th place. KML also had three players in the Junior Varsity section: freshman Emmie Lechmaier, junior Maddie Lechmaier, and junior Eric Rodell. Eric won three of his games on Saturday, which meant he brought home a medal. Despite being short-handed, the JV team managed to finish in 9th. Under the leadership of our two seniors, these young players grew through the State experience and will come back hungry to win next year. “I learned…” was the theme of the weekend, as well as building mental toughness and the determination to come back after a tough game.